The following extract is from an excellent story by Ellie Honeybone at ABC Great Southern looking in depth at the popularity of Australian Rules football in Europe, driven heavily by the uptake of the game by women across Europe. 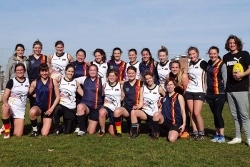 A growing number of women and men are signing up to play Australian Rules in Europe and there are hopes a women-only league will be established in Switzerland in the next few years. Katherine Dellar spent her childhood playing AusKick with the boys, and played Australian Rules for the Australian National University in Canberra. When the 30-year-old moved to Switzerland 18 months ago she had no idea the sport would once again become part of her life. "Geneva has a large expat population, a lot of those are Australians, and I heard via word-of-mouth about people who were trying to get an AFL team together," Ms Dellar said. "I had no idea that I would have the chance to play AFL when I moved to Europe, so it was a really nice surprise." In late 2018, Ms Dellar was a member of the Geneva Jets team that travelled to nearby Winterthur to play in a three-team tournament. The Geneva team was made up of both men and women and returned home undefeated after this inaugural Swiss inter club tournament. Ms Dellar and her Swiss teammates play a modified version of the game featuring nine players on the field. In 2019, teams will play 20-minute halves in five round-robin style tournaments. The three teams are from Geneva, Winterthur and Basel and there are plans for a fourth side from Zurich to join the league in 2020. "So far the Swiss League is mixed," Ms Dellar said. "The league organisers have agreed on a few basic rules to reflect the mixed nature of the competition and ensure women aren't tackled dangerously. "Our game does feature full-on tackling. It is proper AFL rules but with just nine on the field at any point in time." In Geneva the game is played on a smaller rugby field, using rugby goals for one set of goals along with some homemade point posts. "I think the skill level is surprisingly high," Ms Dellar said. "What's really nice about it is that there is such a mix of age ranges. In the Geneva team we have people in their 50s and teenagers and everything in between. "You have some players who are slightly more skilled, slightly more fit, but the standard and the spirit in which we play means that people of all skill levels can get involved. "It's quite a small field so there's a lot of sharing the ball around."